Note the steep drop-off at a certain point, when the number of partygoers reaches the maximum capacity of the party's physical location. Clearly people like a good party, but no one wants to get squished. 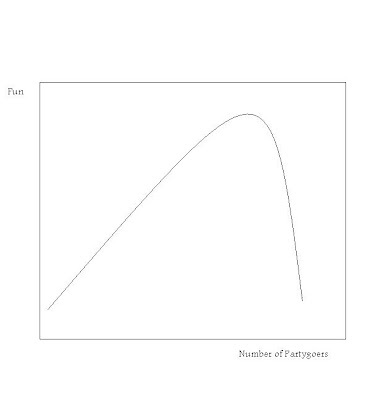 As you can see, the appeal of a party is a function of the number of people already there, and this determines how many people will want to join that party in the future. The self fulfilling prophesy is in full effect. Because of this, the success or failure of a party depends largely on the number of people attracted in the initial stages, and this can depend largely on chance. When a party has reached a "tipping point" of popularity through word of mouth, it can fill up to the point of reaching the maximum capacity of the party's physical location. Then there will be spillover to the less popular parties, and a new equilibrium will be reached. Rather than a drop in total fun occurring at the point of some number of users as we saw with the physical party, there is simply a levelling off. There are diminishing marginal returns to fun here, because, for example with Facebook, you can only have so many Facebook friends (5000 as of today I believe, and even fewer you really interact with on a regular basis). But there is no drop-off in benefit, because there is no restriction on capacity. Unlike a real physical party, this party on the internet shows no sign of slowing down. Facebook has become a fixture, and it would be very difficult for another company to come in and compete with it on its own turf. A new site would need to provide amazing new benefits to compete with the massive positive network externalities Facebook has built up through its user base. 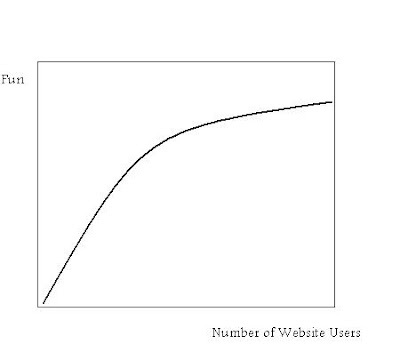 And why did Facebook build up such a large base of users? Partially because it's a very well designed site, but also because of the initial luck of the draw. Mark Zuckerberg's party got the initial rush of partygoers it needed to sustain itself and grow. Without any capacity restrictions, it seems to be here to stay. Even if there were a better party next door, people would probably ignore it. The Invisibility Cloak: Bad for Human Rights?